of often breathtaking ocean views. men’s race, as part of a $5000 prize purse supplied by Saucony. Second place went to Kemsa Mergersa, 24, of Ethiopia (33:51) and Fikadu Lemma, 26, of Ethiopia (34:27) placed third. The first American was Nate Jenkins, 29, of Andover, Mass., (34:32), who finished fourth. James Koskei, 41, of Kenya, one of the world’s top Masters runners, was sixth (35:27). In the women’s division, Chepkurui, who finished 10th overall, also received $1500 for winning, while Salome Kosgei, 29, of Kenya (39:25) took second and Caroline Bjune, 36, of Andover, Mass. (42:16) placed third and also was the first U.S. woman finisher. gift certificates to all age group winners. Among the Cape Ann runners, Matt Curran, 53, of Gloucester (41:26) topped the men’s field, while Layne Alves, 30, of Rockport (44:58) was the first local woman. As Cape Ann’s top finishers, they were presented the first Austin Connors Jr., Cup, a tribute to the late longtime owner of Connors Pharmacy, who also was an avid part of the local running scene. 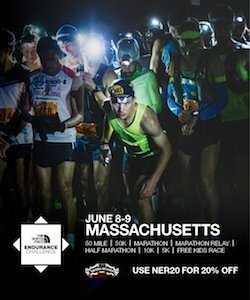 by Dave McGillivray, race director of the BAA Boston Marathon, and his team at DMSE Sports, Inc. Proceeds from the race benefitted the Gloucester Fishermen Athletic Association (GFAA) and DMSE’s Children Fitness Foundation. renovation of Gloucester High’s Newell Stadium. line before Sunday’s race, McGillivray presented Gloucester Mayor Carolyn Kirk with a framed bib #1. Kirk announced that she is committed to running next year’s race, set for Sunday, August 21, 2011.